The Dahlgren Heritage Museum opened its doors in October, but it is now celebrating regular operating hours. The museum will be open noon to 4 p.m. every third Saturday in the former Virginia Gateway Visitor Center at Naval Support Facility Dahlgren in Dahlgren, Va. 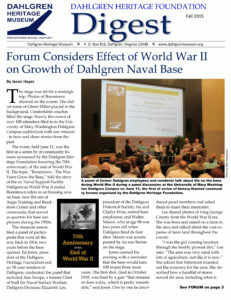 The museum contains military history, but the nonprofit Dahlgren Heritage Foundation, which operates the museum, hopes to add history of the community around NSF Dahlgren to the exhibits. At the University of Mary Washington Dahlgren campus, an exhibit has been up for two years by the foundation displaying the history of the naval base with an emphasis on women and “what it was like to be a woman” at the base. Exhibits in the museum contain artifacts on loan from the U.S. Navy, especially Naval Surface Warfare Center, and community members. The museum also hosts special events such as community forums, said Ed Jones, president of the foundation, who grew up and attended school on the base in the 1950s and 1960s. Jones said a current museum exhibit is a Norden bombsight, a device used in World War II for aircrafts to be more accurate during bombing raids. Bombsights played a critical role in the war and were developed and tested at NSF Dahlgren. Another exhibit is a “little-known part of Dahlgren history,” Jones said, a propeller from one of the unmanned aircraft, which was developed and tested at NSF Dahlgren in the 1920s. The museum is not operated or funded by the U.S. Navy or any naval commands at Naval Support Facility Indian Head and NSF Dahlgren. However, commands at NSF Dahlgren are supporting the museum with artifacts donations and collaborating with special events. “Part of understanding Dahlgren is it came from Indian Head,” said Robert Gates, former technical director of NSF Indian Head and vice president of the Dahlgren Heritage Foundation. Gates worked at NSF Dahlgren for 37 years before working at NSF Indian Head for more than three years and retiring in 2011. Gates said that in 1918, projectiles from the firing range from NSF Indian Head were going too far into the Potomac River and “kept hitting Virginia.” At NSF Dahlgren, a longer range is possible for testing. “That became very important,” Gates said. The foundation began plans for a museum in Dahlgren when the U.S. Navy was changing its museum policies and not providing money for museums, Gates said. So in summer 2010, the foundation began raising funds with the goal of opening a museum during the 95th anniversary celebration of NSF Dahlgren, which was in October. “What we were always trying to do was to get where we could have regular hours,” Gates said. The foundation also hopes for more volunteers so that the museum can be open during the week and have a director. The goal is to have weekday hours before NSF Dahlgren’s 100th anniversary in October 2018. The foundation also has goals of fundraising to expand the current exhibit, as well as to build a new building in the future because when the new Gov. Harry W. Nice Memorial Bridge is built, it is planned that the museum’s current building will be destroyed, Gates said. Many years ago a small museum was on the naval base, Jones said. Admission to the museum is free, but a bus tour of the naval base costs $10 per person. Jones said the Naval History and Heritage Command in Washington, D.C., which oversees naval museums across the country, does not oversee the museum in Dahlgren. The Dahlgren Heritage Museum is not an official naval museum but is working to be a model for museums of the future, which Jones said will be community supported. Funding for the museum’s first round of exhibits, Jones said, was provided by a $50,000 grant from Dominion Virginia Power’s parent company, Dominion Resources Inc., and a $22,000 grant from local Wal-Mart stores. Private donations also made the museum’s opening possible. Jones and his family lived on the naval base until he was 18. His father was employed on the base at a time when it was more isolated, and most civilians lived on the base. Jones said he considers Dahlgren to be his hometown. “It means a lot to me because whatever success I’ve had in my life I attribute to Dahlgren,” Jones said. Jones said he thinks the history of NSF Dahlgren will be interesting to everyone, even if they have no connection to the naval base. “It’s really quite a story that most people don’t know much about,” Jones said.